In the few years of Italian rule in Ethiopia were done two important improvements: the complete abolishment of slavery and the road construction of a communication system in a mountainous country. Indeed no paved roads existed in Ethiopia before the Italian conquest of 1936. Historian Bertazzini wrote that "...At the outset of the Italian-Ethiopian war, few roads were completed and none had modern asphalt surface. Only two major -but unpaved- tracks for lorries existed in 1935, the Jimma-Addis Ababa and the Addis Ababa-Dessié'...The simple list of the projected roads gives an idea of the magnitude of the investments undertaken (by the Italians). The vast majority of the works were managed by the AASS(Azienda Autonoma Statale della Strada), a public company purposely created by the Minister of the public works. The AASS obtained an incredibly large budget from Rome: not only did the six-year development plan destine more than 7.7bn Italian Lire (out of the total 12bn!) for road construction, but the AASS even received additional 3.1bn Lire, for the ﬁnancial year 1936-7. In 1939, the newly built colonial transportation network totaled roughly 4,625 km of paved roads and 4,877 km of unpaved tracks...". With the main roads of this AOI road plan, all asphalted and served by important infrastructural works, at the same time it was created a widespread secondary connection network (up to 4,000 km of development) that guaranteed the links of the smaller centers to the primary roads (please read in Italian the writings -with photos- of Nicky Di Paolo: Le strade italiane in Africa Orientale" www.ilcornodafrica.it/st-strade.htm). The construction of the AOI road system was carried out urgently on Benito Mussolini's orders, but there were considerable increases in the cost of the works (that reached nearly 3/4 of the total Italian budget for the colonies). The Italian presence in the Horn of Africa began with the establishment of private commercial bases in Eritrea and Somalia. Initially, in fact, the Italian government was not willing to intervene directly and therefore only supported private enterprises’ initiatives. Eritrea, where the ﬁrst Italian settlement dates back to 1869, received the legal status of colony in 1882, whereas Somalia, where private capital penetration had begun in the early 1890s,became a colony in 1905. The intensity of the Italian colonial activity between 1880 and 1920 was low, due both to the limited resources that Eritrea and Somalia had to oﬀer and the modest commitment of the liberal governments towards the development of these regions. After Benito Mussolini seized power in 1922, the colonies received more attention and resources. The renovated emphasis that the dictator placed on colonial expansion was due, on the one hand, to the fact that the colonies could provide the regime with military successes and the mirage of unlimited land for the Italian people, both extremely important elements of the internal propaganda. On the other hand, especially after the autarchic shift of the early 1930s, Mussolini was convinced that a large colonial empire could furnish raw material for manufacturing and an export market for Italian goods. Consequently, the government implemented a more aggressive colonial policy, that ultimately culminated in the invasion of Ethiopia in 1935. This episode, which arguably has no precedent in colonial history both in terms of magnitude of the deployed army and violence against any form of organised resistance, allowed Mussolini to declare the foundation of the “Italian Empire” on the 9th of May 1936. The annexation of Ethiopia to Eritrea and Somalia substantially enlarged the Italian territories in the area, which were re-organised in the “Africa Orientale Italiana” (AOI). The war and the subsequent large public expenditures, aimed to “develop” the Empire, constitute the historical framework for the intense road construction activity studied in this paper. The ﬁrst organic intervention on the Ethiopian road network dates back to the second half of the nineteenth century and followed the formation and consolidation of the Amhara Empire. Emperor Tewodros (1855-68)was responsible for the creation of an embryonic centralized unpaved road network which gravitated around the Amhara region in the northern part of the country. This network was comprised of simple paths, appropriate for the rapid deployment of infantry troops. A net improvement, both in terms of quality and extension of the existing network, was achieved under the emperors Menelik II (1889-1913) and Hailé Selaissé (1920-1936), who better understood the importance of transportation infrastructure in achieving military and political control over the heterogeneous regions of the Ethiopian empire. 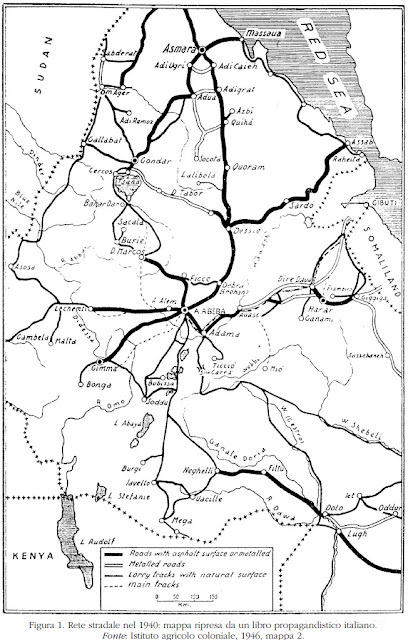 The road network was then centred on Addis Ababa, elevated to the rank of capital of the empire by Menelik in 1889. Hailé Selaissé instituted the Ministry of Public Transport and promoted more structured road building plans, starting in the late 1920s. This project, which aimed to connect the major centers of the empire with Addis Ababa, was not completed due to the outbreak of war as well as the lack of ﬁnancial resources, materials and know-how. As a result, at the outset of the Italian-Ethiopian war, few roads were completed and none had modern asphalt surface. Only two major unpaved tracks for lorries existed in 1935, the Jimma-Addis Ababa and the Addis Ababa-Dessié. The situation in Eritrea and Somalia before 1935 did not greatly differ from the one described above: these colonies were neither particularly densely populated nor endowed with valuable natural resources that could justify signiﬁcant investments in infrastructure. In Somalia, only 4 major lorry tracks existed in 1925, and none of them was paved: these connected Mogadisciu with Brava, Lugh Ferrandi, Oddur and Fer Fer. In the same year in Eritrea, only the region of Asmara showed a more developed road network: paved roads with rudimentary asphalt surface connected Asmara with the port of Massawa and with the towns of Cheren, Adi Qualá and Adi Caieh. Between 1934 and 1935, several interventions were carried out in the two aforementioned colonies in order to provide logistic support during the Ethiopian military campaign. In Eritrea, the artery connecting Massawa to Asmara was re-paved and some parts of it were improved by making hairpin bends smoother and the carriageway larger. Moreover, the military engineers rapidly built the road Nefasit-Decameré ex nihilo, which aimed to direct the traﬃc coming from Massawa directly to Adigrat without passing through Asmara. After the occupation of Macallé, in 1935, the road Adigrat-Macallé was quickly built in order to support military penetration. At the battle of the Ascianghi Lake (MaiCeu, end of March 1936), the last part of the Ethiopian army was destroyed. General Badoglio, the Italian commander in chief, started planning the march towards Addis Ababa: all available men were employed to refurbish the track Macallé-Quoram-Dessié-Addis Ababa. After the conquest of Addis Ababa on the 5th of May 1936, the war was oﬃcially concluded. Mussolini immediately stated that the priority in the newly founded empire was to build an extensive highway network as quickly as possible. Several reasons motivated him: ﬁrstly, the peripheral regions such as those of Jimma and Gore were completely out of control, due to the impossibility of moving troops eﬃciently. Secondly, some of the major cities of the empire, such as Gondar, Harar, Dire Daua and even Addis Ababa, were at risk of remaining isolated during the rainy season (between June and September). Thirdly, the army and the civilian personnel in the main centers needed a constant ﬂow of supplies from the Italy. Finally, it was necessary to create a network through which the main cities of the AOI could be connected with each other and ultimately be integrated with the metropolitan market. Roads were cheaper to build than railroads, faster to realise and, moreover, it was clear that for at least the next 20 years the trade volumes would have not justiﬁed the construction of railroads. Mussolini personally laid out a comprehensive infrastructural plan, that was oﬃcially communicated on the 19th of May 1936. Five main arteries had to be realised immediately. These were the Om Ager-Gondar-Debra Tabor-Dessié (650 km), the Debra Tabor-Debra Marcos-Addis Ababa (500 km), the Adigrat-Dessié-Addis Ababa (850 km), the Assab-Dessié (500 km) and the Addis Ababa-Jimma (350km). TheA ddis Ababa-Allata-Neghelli-Dolo(1,100km) had to be constructed in a second phase. Some of these projects were started but not completed due to the outbreak of WWII. The simple list of the projected roads gives an idea of the magnitude of the investments undertaken. The vast majority of the works were managed by the AASS (Azienda Autonoma Statale della Strada), a public company purposely created by the Minister of the public works. The AASS obtained an incredibly large budget from Rome: not only did the six-year development plan destine more than 7.7bn Italian Lire (out of the total 12bn) for road construction, but the AASS even received additional 3.1bn Lire, for the ﬁnancial year 1936-1937. In 1939, the newly built colonial transportation network totalled roughly 4,625 km paved roads and 4,877 km unpaved tracks. The construction of this vast road network did not prevent Italians from being expelled from the Horn of Africa in November 1941. During the military events of 1940-1941, the Italian troops were progressively forced to abandon all the territories of the AOI. In order to slow down the British oﬀensive, the army destroyed several bridges, tunnels and large parts of the asphalt surface. Some of the major threats to network’s integrity were the disruption of the "Mussolini Bridge" between Agordat and Cheren, of the ramp that gave access to Cheren from the North-West, the dismantlement of the surface of the Mogadisciu-Harar, of the Addis Ababa-Dessié and of all the arteries that gave access to Gondar. Emperor Hailé Selaissé regained full control over Ethiopia and Eritrea by the end of 1941, after the Italians last stand at Gondar. The economic stagnation that hit the area in the 1940s along with the endemic lack of international capitals, prevented the independent imperial government from undertaking any comprehensive maintenance plan. This eﬀect cumulated with the disruption caused by the war and yielded a substantial deterioration of the road network that shrank from about 6,000 km in 1940 to about 1,000 km in 1951. Finally, by lowering transportation costs, the colonial road infrastructure attracted ﬁrms, workers and other public facilities (like schools and Hospitals) during the colonial era. This direct eﬀect (with improvements in the related sanitary areas, that experienced the disappearance of endemic malaria in Ethiopia) persisted in the early post-colonial period. In other words, the economic landscape of Ethiopia and the Horn of Africa was substantially modiﬁed by the direct eﬀect of Italian colonial investments (mainly in infrastructures like roads) between 1931 and 1941. At this point, the regional economy had reached a resilient spatial equilibrium that persisted until present.